Unfortunately, DanceMasters does not have the capacity to handle the transfer for couples (even for the top star couples). 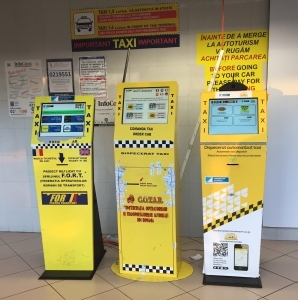 Luckily, Bucharest Otopeni Airport is taxi-friendly: there are electronic machines with touch screen in the exit hall, which calls automatically official cabs for you and give you a voucher indicating the taxi company name and the number of the car. It is possible to chose companies or fares (lei/km). After you get the order confirmation through a voucher, the taxi arrives in 3 to 5 minutes in front of the entrance of that hall. The system is safe. By using this system it is impossible to be tricked by false taxis or “wise guys” approaching you to offer unauthorized taxi services. One way from the airport to your hotel (RIN Grand Hotel for example) will be around 15 Euro. Also, when you depart, you ask the hotel to call an official cab for you and the price would be the same. From the RIN Grand Hotel hotel to the dance hall the taxi fare is about 5 Euro. The official partner of our event for taxi services is GTI TAXI. You can download the GTI TAXI App (iOS and Android) on your smartphone to travel more easily in Bucharest during the event, using one of the thousands GTI TAXI cabs at your disposal. GTI TAXI is an application that allows you to acces: a large numbers of cabs from different companies, carefully selected drivers and details about them, and last but not least it gives you details about the features of the selected cab, all of it so you can make the proper choice.